Home for the next couple of weeks in Caen. New Zealander Jane Thompson settles in to make Caen home for the next couple of weeks as she prepares to cover the Alltech FEI World Equestrian Games in France for Horsetalk. 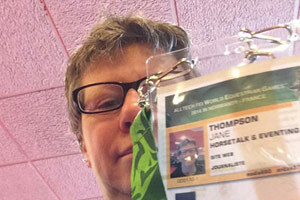 Jane Thompson and her accreditation for WEG. The house we rented is ideally located, being smack bang in between the Games Village (where much of the social action will take place) and Stade D’Ornano, where all the show jumping and dressage will be held. I have walked to both locations to see what is going on – lots of last-minute preparation, including digging up and re-laying carpark tarmac just outside! Talking of car parking, I think the biggest challenge will be transport. Apparently there are many roads in Caen itself that will be closed while WEG is on. Getting out to the eventing at Haras Du Pin will be interesting, but there are trains scheduled, and media people can catch shuttles from the media hotels on request, so hopefully it will all work out. Picking up my accreditation was so very simple. As I am here early, I didn’t have to queue, in fact on Sunday we were the only visitors to the accreditation office that morning, with the exception of a few hardy staff. The worst bit was the compulsory mug shot that had to be taken. No goody bag or giveaways, just the media accreditation which is in itself a real goody! No information either, especially to queries about opening ceremony and car passes but hopefully we can find out a bit more closer to the time. Caen itself is a lovely town. I have lost count of how many boulangerie / patisseries we have seen and in our little neighbourhood, there is one at one end of our street, and three at the other! We have also found the people to be very friendly, and helpful. My limited schoolgirl french seems to be enough to get by, as so far I have ordered the food I was after and haven’t got too lost, so all is well. I think the secret is to try, and to smile a lot. We visited Juno beach, a 20 minute drive from central Caen. It was well worth the visit, and we did the guided tour outside, going underground to view the bunker and defence posts the Germans built. The Canadian memorial centre was also very good; the movie at the end of the museum was very touching. The Normandy beaches we have visited (Juno and Cabourg) are very windswept, long white beaches where the tides go out a long way. The nearby restaurants specialise in Moules (Mussels), which are delicious, small and sweet with a wide selection of sauces available to go with them, accompanied by the compulsory bowl of frites. The seafood sampled so far has been delicious, fresh and served to us beautifully presented. Once again, social media has proved very interesting to see everyone from all parts of the world making their way towards Caen, from so many directions. Some of the FB postings sees Kiwis stopping off during their long flights to the other side of the world. Many are already in Europe, visiting Paris or Rome or other fabulous locations. Our Team NZ Supporters at WEG Facebook group has grown really fast, and already social events have been organised through that page as well as lots of other helpful information. So, reporting from Caen, it feels like the calm before the storm. I am heading off to Brittany today for some non-horsey business, but hope to be able to call into St Mont Michel on the way back this afternoon.